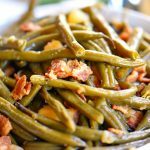 Slow Cooker Green Beans with Bacon is one of our very favorite side dishes! 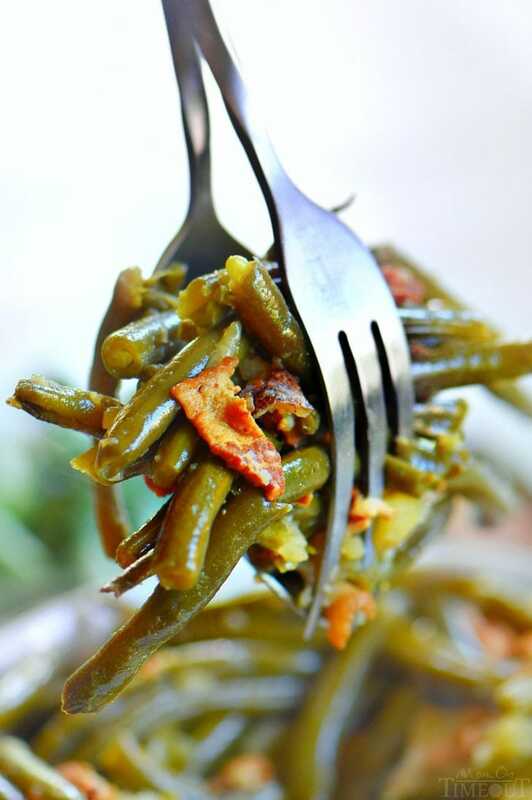 Packed full of flavor, this easy green beans recipe takes just a handful of ingredients and a few minutes of work. Enjoy these tasty crockpot green beans with The BEST Homemade Baked Mac and Cheese or The BEST Turkey Meatballs with Herbed Gravy for an amazing meal! Side dishes are the most fun part of any meal, wouldn’t you say? I think this is where we get to be the most flexible and creative. During busy weeknights, our side dishes are usually limited to one, possibly two dishes, most like a veggie of some sort. Years ago I shared my Nana’s Green Beans recipe with you all and the response was amazing. Many of you wrote in asking if the green beans could be made in the slow cooker and the answer to that is a resounding YES. In fact, I make them this way all the time now. It’s something I can get started in the morning and they’re ready to go by dinner. I just love that. I have come to rely on my slow cooker more and more over the years as my schedule has gotten more and more chaotic. Many of our favorite meals are made in the slow cooker including Slow Cooker Italian Beef Sandwiches and this Slow Cooker Shrimp Boil. These green beans don’t need a lot of ingredients which is pretty impressive considering the big flavor. 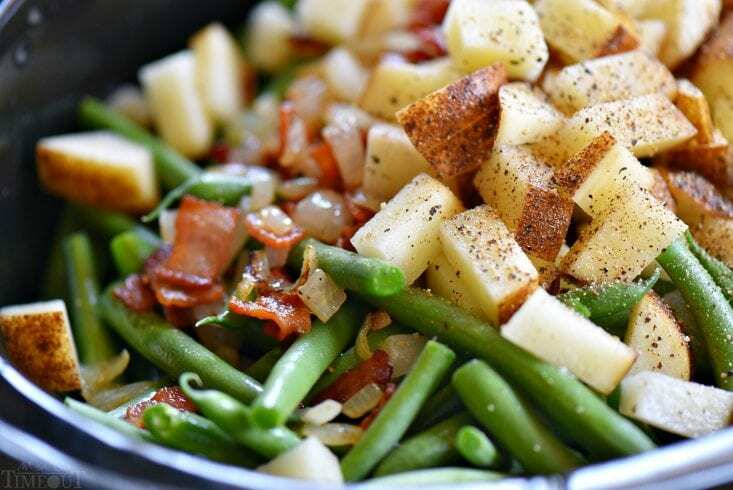 The slow cooker does a lot of the work for you, melding the flavors together and creating an environment that allows the green beans to just soak in the flavor of the bacon and potatoes. My family prepares these southern style green beans all year long. My Nana would frequently make them with potatoes, like I’ve done here today but the potato is not super necessary if you’re opposed. 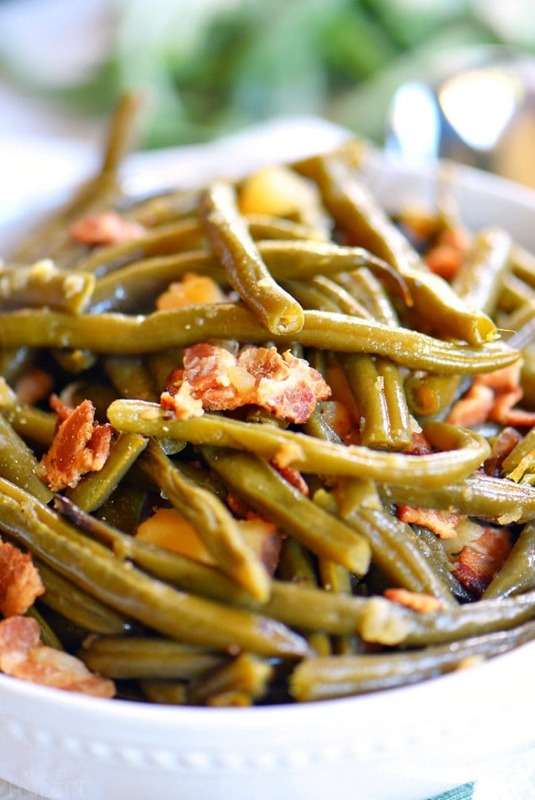 I’ll be making these green beans next week for Thanksgiving and then just a few weeks after that for Christmas. My family wouldn’t have it any other way. 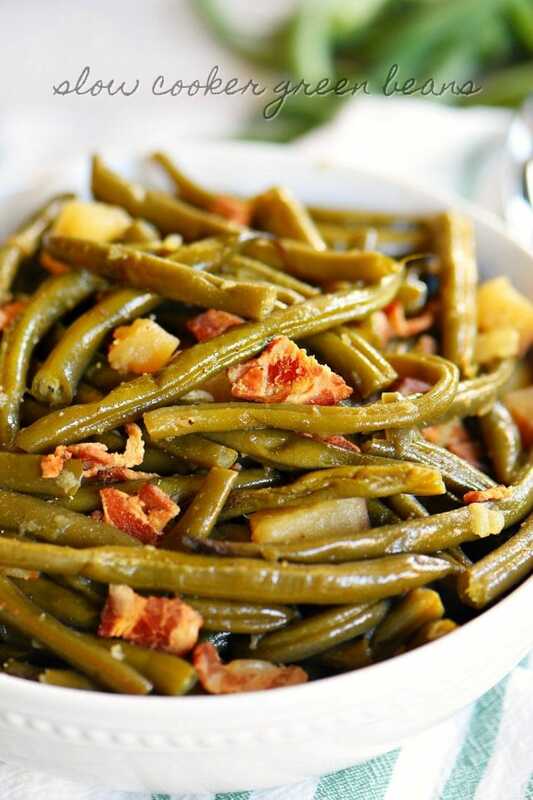 These easy Slow Cooker Green Beans with Bacon is one of our very favorite side dishes! Packed full of flavor, this easy green beans recipe takes just a handful of ingredients and a few minutes of work. Cut the bacon into small pieces and cook over medium heat until the bacon is fully rendered and crispy. Add the onions and saute with bacon until transparent. Lightly spray a slow cooker with cooking spray and add green beans. and pepper and stir making sure the bacon drippings are getting mixed in well. Add bacon and onion mixture followed by the diced potatoes. Add chicken broth, salt and pepper to taste. I frequently don't even add salt because the bacon has so much already. Cover and cook on low heat for 6 to 8 hours or high heat for 3 to 4 hours or until beans reach your desired level of tenderness. the green bean recipe looks delicious!